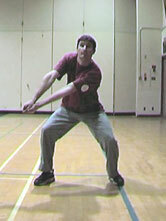 The forearm pass, or “bump” is often the most important skill because it begins the “Pass – Set – Hit” sequence. If you make a perfect pass, you have increased your chances of a good offensive play. If you shank it or fire it into the net, your team will have a more difficult time setting and hitting. Here are some points that I think will help you improve your passing…I could go on and on, so no matter what, this piece will be incomplete. Email me if you want more detailed information. I think “a” and “b” are self-explanatory. “c” simply means that you can lock your elbows (which ensures “a”) by pointing your thumbs toward the floor. a) Start with your knees bent and be ready to run. b) Run (using your arms) to the point where you will be passing. c) Stop running, then pass. When I say use your arms, I mean pump them like you would if you were sprinting. A lot of beginners think “Oh, I have to pass!” so they run around with their arms together (platform), halfing their speed and doubling their goofiness in one maneuver. I moved, I have a platform, NOW WHAT?! Platform f aces Target: You know what your platform is, your target is the spot on the floor that the setter occupies. No matter where you are on the court, if you can adjust your body so your Platform faces your target, you’re in good shape. If you are an absolute beginner, your target should be up, I mean WAY UP, and in the middle of the court. Shoulders face Ball: You need to line your body up so it is easy for your platform to face your target. The best passers face the path of the ball, or the direction that the ball is coming from. It is NOT crucial (contrary to popular belief) that your shoulders face your target. Pass with your arms (only! ): The best passers are the most efficient. They use as few muscles as possible to move the ball, to decrease the number of moving parts involved in the skill. Once you are in position to pass, make your platform and swing your arms. DO NOT FOLLOW THROUGH. That means, as soon as you have contacted the ball, stop your arms.